What is a CFA Fire Tank? All above ground Static Water Supplies must provide at least one 64mm, 3 thread/25mm x 50mm nominal bore British Standard Pipe (BSP), round made coupling. All valves and pipework between the water supply and the outlet must be minimum of 50mm nominal bore. This being to ensure than an adequate water pressure is achieved. For full details on the CFA Requirements please click here. 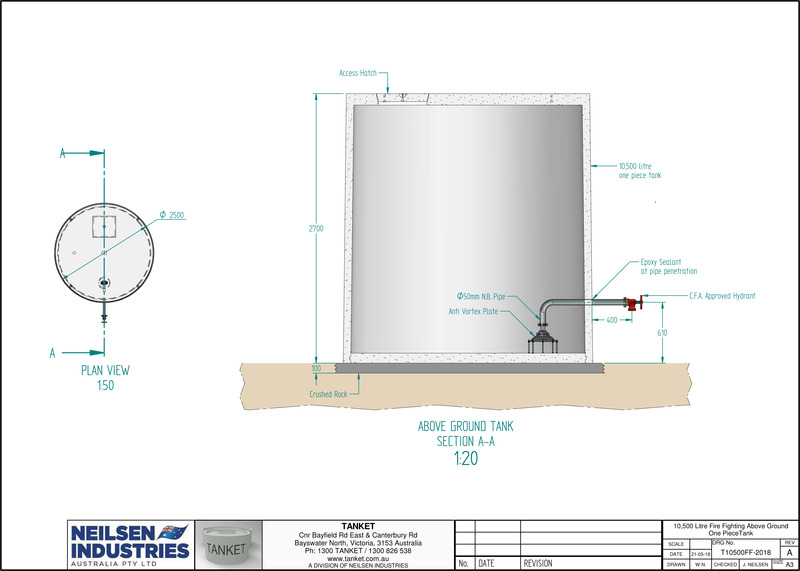 All Tanket tanks are made from concrete, making them a sensible option for water storage. Concrete tanks can be stored underground as they are built to withstand the harsh Australian climate. With our tanks being available as both below and above ground, our Concrete Water Tanks are available from 10,500L to 33,250L. 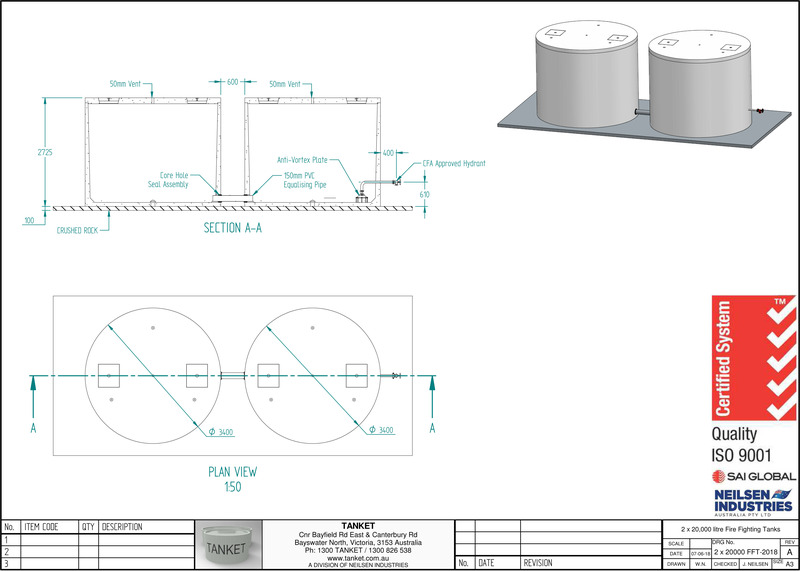 In cases where more than one tank is required, tanks can be joined using steel equalizing piping. 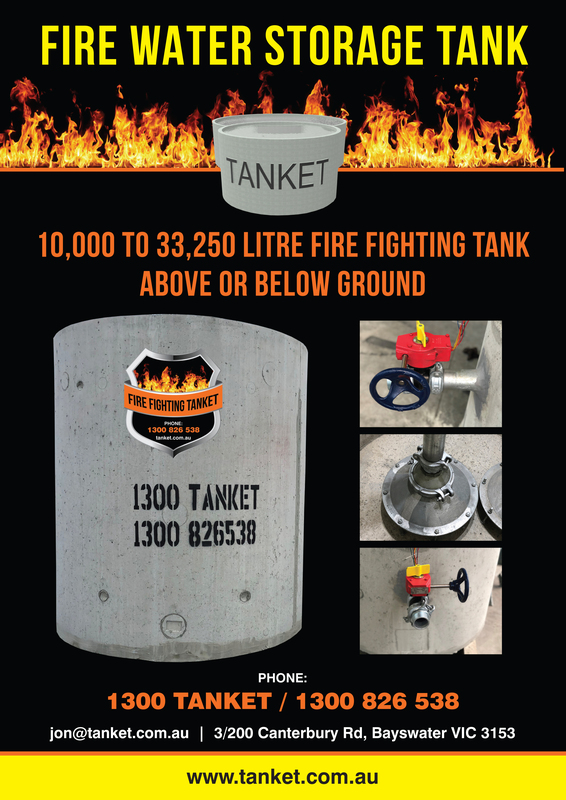 If looking for a larger CFA Fire Tank, please send your requirements to us via our Contact Us Page or call us on 1300 862 538. 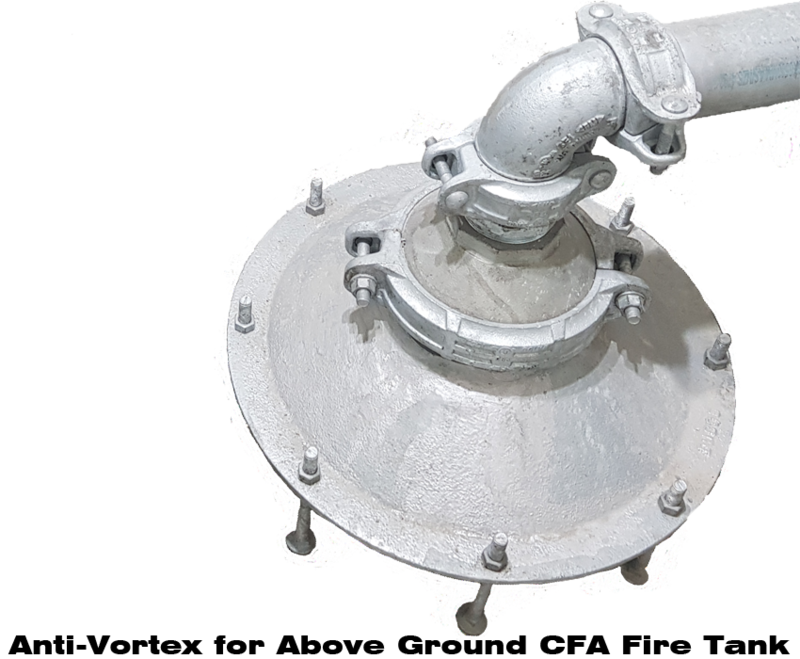 All standard Tanket CFA Fire Tanks include an 50mm nominal bore pipeline with Anti-Vortex system to suit, along with the required CFA fittings. Available as an upgrade, our CFA Fire Tanks are available with an 150mm nominal bore pipeline with Anti-Vortex system to suit, along with the required CFA fittings. 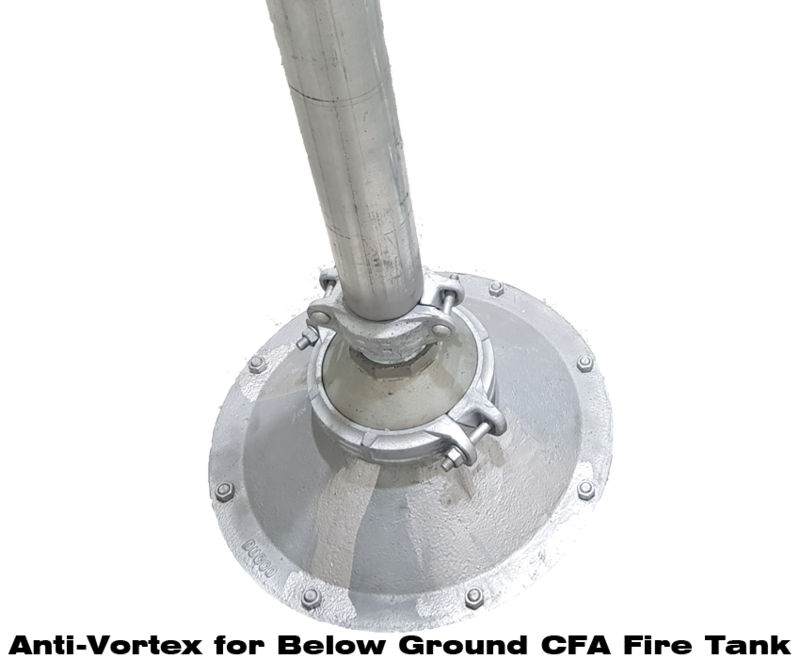 The advantage of upgrading to this system is the pumping of the Static Water Supply is much quicker with the larger diameter nominal fittings. This is often used by Metropolitan Fire Brigade (MFB) as well as Country Fire Authority (CFA). All our CFA Fire Fighting Tanks include an Anti-Vortex system, which is used to eliminate air venturis in the process of pumping water water from the tank outlet. The Anti-Vortex Plate sits off the bottom of the CFA Fire Tank, its purpose being to stop water from swirling when it is being pumped up by the CFA. In other words, imagine you fill a bath with water and when you drain it, the water gets that swirling action from the drain hole which is known as a vortex. The Anti-Vortex system will eliminate the swirling water from the suction of the high flow pump from the fire truck. 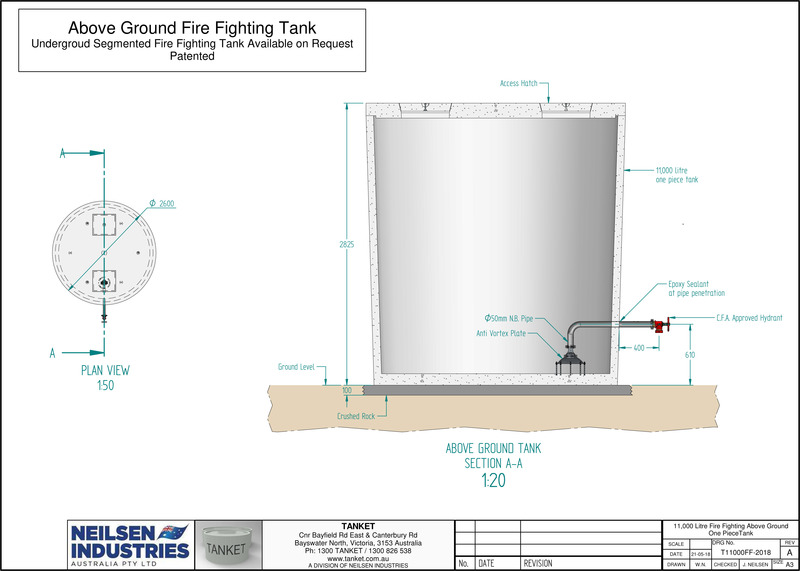 Please see below our Tanket Fire Fighting Tank Drawings.